On the 10th March 2017, I shared this video on Facebook, with the wider falconry and animal training community. This is Jess, a nervous female Harris Hawk whom I had been working with closely. Jess, like all birds of prey, is very intelligent but we were having issues with neo-phobia (fear of new things and objects) when out flying and during public demonstrations. I decided to explore the idea that enrichment and training may help her overcome some of this fear…. and it worked! This video though not only showcased Jess’s problem solving and memory skills (this was the first time she had seen this puzzle again for 6 months) but it also had wider implications for me. Amongst the many positive messages, I also received a backlash from, shall we say, more traditional members of the falconry community. This including informing me that Jess was not a parrot, which I knew, and that I should stop messing around with her and fly her properly, which I already did! page 1. Shepherdson, D. J. (1998). Tracing the path of environmental enrichment in zoos. In: D. J. Shepherdson, J. D. Mellen, & M. Hutchins (Eds), Second nature: Environmental enrichment for captive animals (pp. 1-14). Washington D.C.: Smithsonian Institution. page 6. Clark, F. E. (2011) Great ape cognition and captive care: Can cognitive challenges enhance wellbeing.? Applied Animal Behaviour Science, 135,1-12. Although we tend to categorize enrichment into various forms such as environmental, food, social etc it seems that cognitive enrichment can span a few different categories and all animals use their brains in all situations. I decided to focus on two main areas with my birds, environmental and training. One of the main points that stands out in Clark’s definition above is the idea of control, we are all getting quite on board with the idea of control during training but what about in the animal’s normal environment. Birds of prey in particular often have very little control over their aviary space, with many hawks and falcons being tethered. Tethering does have its place in husbandry but I am not going to get into a debate about that as it is a vast subject for discussion… maybe for another blog. Anyway, I made the decision early on in my business that all of my birds would be what we term free lofted, that is in an aviary without tethering so they are free to move around different perches. This is where the element of control comes in, if all the perches in the aviary are made of the same thing and behave in the same way, as in are fixed, then although it looks like there is an element of choice this can be increased by changing the perching design. We use many different perches: swings, rope, branches, astroturf, logs, bungees covered in astroturf and platforms or shelves. We have also designed a unique perching bracket system (see video below) that allows us to change elements in the bird’s aviaries very quickly keeping the environment flexible and stopping the birds developing repetitive flight paths, a massive problem for birds in aviaries. The other elements we can control in the aviaries is the addition of sand baths, water baths, showers, tunnels, and plants. These static objects may seem like small additions but they can help encourage natural behavior and foraging. Sand baths are great for adding live insects such as mealworms and locusts too, our small owls love chasing them around and digging through the substrate for them… in fact, our larger birds do as well. Watching a long-legged Harris hawk run after a locust is very enriching for us to watch too! For birds of prey one of the main reinforcers in their life is food, in fact, with some, I get the impression that I merely exist to them in order to bring them their dinner. Food presentation can be a great way to get a greedy bird to slow down and think things through a bit, as well as a great learning opportunity to explore new objects and problem-solving behavior, such as seen with Jess in the first video. Our common buzzard, Elki also enjoys a forage box, with newspaper twists with bits of food in, and sticks and leaves. Once he has destroyed the box completely and got every bit of food out, which normally takes him up to an hour to do, he will then carry around the torn paper and sticks and ‘play’ with them for several hours afterward. This is one of his favorite enrichment items and he seems to get very excited when I bring the box over, more so than just his food straight on to a shelf as normal. This is also a wonderful demonstration of contrafreeloading, the theory that when given the choice, an animal seems to prefer to earn its food rather than be handed it on a plate. I have come across this so much whilst working with my birds and it is a lovely thing to see. Elki will ignore food he has already removed from the box in favor of finding more pieces still in the paper and sticks. Another ‘puzzle’ feeder idea that we made was a meal worm dispenser over a sand bath, this worked very well for Kit, our African Spotted Eagle owl. Kit, bless his soul, is not the most active owl shall we say, and also has a habit of wolfing down his food and then stomping round his aviary complaining that every one else is still eating so why isn’t he! The aim of the meal worm feeder was to keep him mentally and physically active for longer in his aviary. We made it out of his normal tyre sand bath with a piece of plastic piping in a loop over it, and attached a reptile meal worm dispenser that you can buy at the pet shop. It worked really well and he did work out eventually that if he landed on the pipe it would dislodge the meal worms quicker so we have now added a perch to the top of the pipe. It is a much-debated topic in the animal keeping industry as to whether training can be classed as enrichment or not. I personally believe it definitely does and, in a way, can be one of the most enriching things we can do with our animals. Training allows them to experience more freedom, choice and control in many situations, and in the case of our birds ultimately leads to free flight. Flying is arguably one of the most enriching activities a bird can do. At The Feathery Folk we have tried to take this one step further. We always try to use +R training with our birds and in its essence traditional falconry is the original +R. Without trust and reward our birds will not fly for us and those principles underpin everything we do. We have tried to adapt slightly though and we are working on a lot of husbandry training at the moment. Most of our birds will now sit on a glove to have their beaks and talons trimmed, with little or no restraint. This is a massive step as beak trims generally mean full restraint wrapped in a towel which is stressful for everyone involved so I am very glad that we have managed to almost completely phase this out now. I am currently working with Boo, the Striped Owl, with the aim to be able to do a full unrestrained equipment change. He is still learning his bridge, ‘good’, and is not the most patient or still owl to work with so you can see from the video below that we have a little way to go. He does seems to love these training sessions and I have noticed a massive improvement in his all-round demeanour. He is more relaxed in his aviary and seems to be a lot less unnerved when we go in with new equipment or tools now. The last point I would like to touch on is species-specific training. I have a collection of 14 birds of prey, consisting of 13 different species from a Little Owl to a Harris Hawk, so we have a lot of different natural skills there. We try to find each individual species niche and to find a behaviour that may be unique to them. This gives us a great training opportunity and really get our brains, and theirs, working overtime trying to work on this new behavior. All our birds are trained to various generic hand signals and commands such as a whistle recall and wait. We then work on their unique talents, Kit our African Spotted Eagle owl for example loves to run around on the floor. This is natural for him as they are a ground-nesting species and will forage amongst the grass. Since we built this into a specific behavior he has really come out of his shell in demonstrations and keeps the audience amused by legging it around the arena looking for little pieces of food we have scattered. It is also an excellent educational talking point, so not only enriching for him but also the public. My proudest training moment however has been with Pippin, our 1 year old Common Barn Owl. Pippin has surpassed all my expectations so far and I am so excited to see how far I can go with her. To date she knows 4 different commands and hand signals, one of which is ‘up’ for a hover behaviour. Hovering is very hard work for a bird and barn owls will do it for just a few seconds allow themselves to pinpoint their prey accurately. It was a staged process with Pippin involving a lot of shaping but she picked it up so quickly and as you can see in the video below she is pretty good at it now! I hope I have enlightened you a little on the possibilities for enrichment for birds of prey, but also I hope that I can encourage everyone to not think of the supposed restrictions of the taxa you are working with. Owls are generally thought of within the falconry world as being a little bit slow and stupid, and certainly not something worthy of spending time enriching. I, however, think that they are vastly underrated and are far from bird-brained! In fact, having worked with them now for 10 years I feel we should reclaim that insult and we should be proud to call ourselves bird-brained, I know I am. Libby has always had a love of birds and owned two Senegal parrots in her teens, one of which, called Stoney, had a lot of behavioral issues due to being caged continually without any toys or interaction. Helping Stoney sparked an interest in +R training and enrichment for birds. Libby has been working with birds of prey for about 10 years after undertaking a falconry apprenticeship alongside studying Animal Management at Reaseheath College. Libby set up The Feathery Folk as her own business nearly 4 years ago. Having always been interested in training and enrichment Libby was keen to incorporate this into the husbandry of her birds, even in a commercial setting. 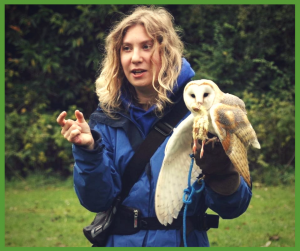 In 2016 she gave her first presentation on the subject of enrichment for birds of prey at the Abwak (Association of British and Irish Wild Animal Keepers) Symposium at Folly Farm in South Wales. It was very well received and on the back of this, the Bird of Prey Enrichment Facebook Group was set up. This now has over 1000 members from all over the world and has been a great platform for sharing ideas. Since then she has given presentations on this subject for other organizations including The Female Falconers Club. Libby is very proud of The Feathery Folk teams’ husbandry and training practices and they have even designed and pioneered a new changeable bracket perching system that has even been used by London Zoo. Love seeing her devotion to helping this hawk live a fulfilling life! I have the pleasure of working with a very special and intelligent Buteo. I am always looking for new, creative enrichment for her. What is the ‘toy’ that Jess is using in the video? I’d love to try that but can’t seem to find anything like it.